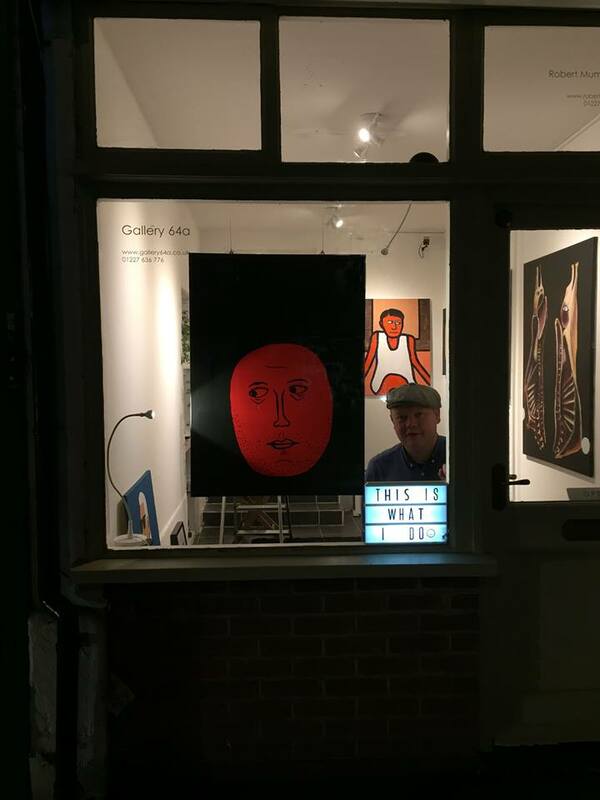 Last night Gallery 64a put on a 7 hour exhibition as part of the "Oxford Street Showcase." More than 28 retailers and organisations connected to Whitstable's most popular street did something special for the occasion. St Alphenge's infant school had their own Christmas Fair, Novelist invented a new Oxford Street Cocktail, The Library had Northern Soul DJs and live bands playing - a splendid time was had by all. At Rob Mumby's 64a Gallery 26 Harry Pye artworks were exhibited (many for the first time). 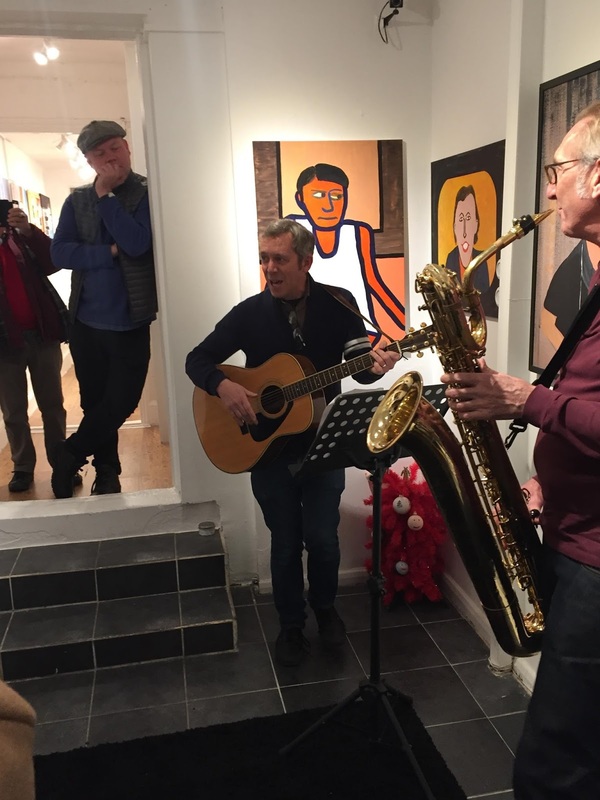 Saxophonist Paul Speare debuted two new pieces he'd composed specially, there was free Swedish glogg and delicious cakes and biscuits provided by Maria Ohlson. 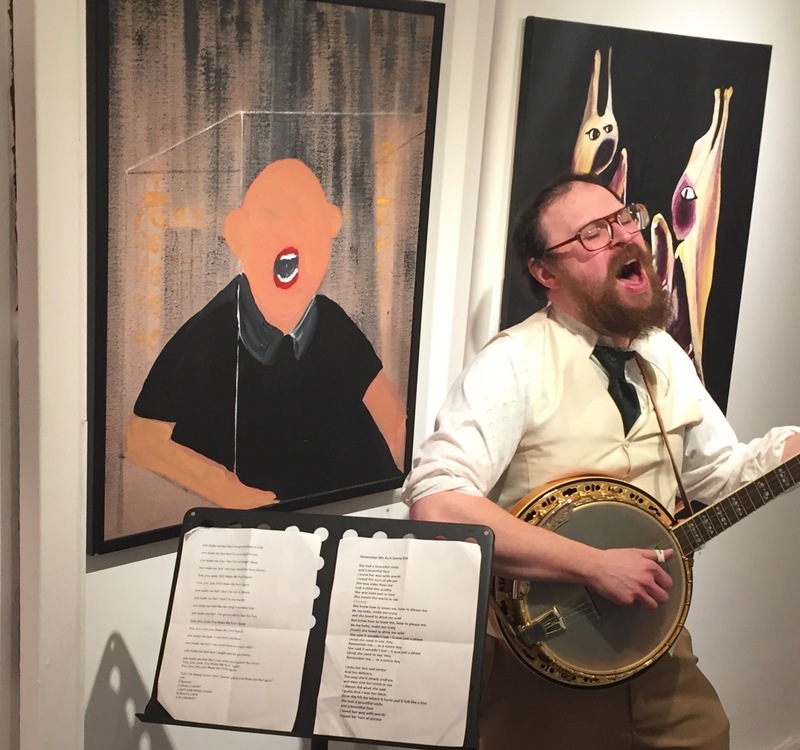 And Banjo player extraordinaire Richard Lamy jammed with special guest singer Mikey Georgeson. Image Above: Richard Lamy sings his heart out. Behind Richard you can see Pye's tribute to Francis Bacon and a painting Pye made in collaboration with Rowland Smith called "Let's Get It On". Above: "Hello, Good Evening and Welcome" (painting of Sir David Frost by Harry Pye and Emma Coleman). Above: "Tin Tin in Deptford"
Above: Some Whitstabalites come to show support to their new local gallery. Above: The lovely Paul Speare who performed "This Is What I Do" (on sax) and "Mr Harry Pye" (on flute) both of which were brilliant. Above: "Citizen Cope" was a painting Harry Pye made in collaboration with Sarah Sparkes. Above: Under Tin Tin there's a painting of David Bowie by Team Beswick & Pye. The painting is called "F*** You, I'm in Tin Machine"
Above: "Waiter, Waiter" is a painting made by Harry Pye with lots of help from Marcus Cope. Above: I asked a young visitor called Ossie to point to his favourite painting in the show. Above: A nice man who lives in both Whitstable and Deptford. To the left of him are drawings of Abi Parry and Richard Lamy. To the right of him is "Tyger, Tyger" and a recent collaboration between Harry Pye and Rowland Smith called, "Don't Look, There's Nothing To See Here." Above: A local artist comes to say "Cheers!" Above: "The Power of Suggestion"
Above: A man who likes David Frost but is less keen on Baroness Chakrabarti. Above: A new track called "Remember Me As A Sunny Day" is unveiled. Above: Fans of the Harry Pye & Rowland Smith painting "I'm Joan Collins and You're Not"
Above: A work from 1988 called "The Ups & Downs"
Above: "Dial P For Pablo"
Above:Above Paul Speare performs "Mr Harry Pye"